At ABC in Beweging you learn, work or play with the Dutch language. At beginners and intermediate level. Non-native and Dutch speakers. Just you or in a small group. Inside or outside your surroundings. Sooner or later. On paper and computer. For certification or graduation. SPEELtaal: playing with the Dutch language. Learn to win. Have fun with your own language skills. 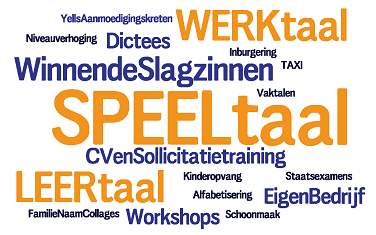 WERKtaal: the Dutch language at your (future) workplace. LEERtaal: learning the Dutch language. You don’t know where to start and you would like to explore your options in your choice of a study? Talk to us, we will listen! Then we will point you in a direction that will definitely fit your needs. Interested? Call or use our contact form for an appointment. We are happy to think along with you and come up with some surprising ideas. Click to listen highlighted text! WELCOME!. At ABC in Beweging you learn, work or play with the Dutch language. At beginners and intermediate level. Non-native and Dutch speakers. Just you or in a small group. Inside or outside your surroundings. Sooner or later. On paper and computer. For certification or graduation. SPEELtaal: playing with the Dutch language. Learn to win. Have fun with your own language skills. WERKtaal: the Dutch language at your (future) workplace. LEERtaal: learning the Dutch language. You don’t know where to start and you would like to explore your options in your choice of a study? Talk to us, we will listen! Then we will point you in a direction that will definitely fit your needs. Interested? Call or use our contact form for an appointment. We are happy to think along with you and come up with some surprising ideas.